The farm serves as inspiration for many of our favorite interior design and holiday decorating styles. Watch any home renovation TV show and you’ll see evidence of the farmhouse influence. Why is the farmhouse style so popular? Most of us are just one or two generations removed from the farm. The old-fashioned farm feeling is nostalgic. 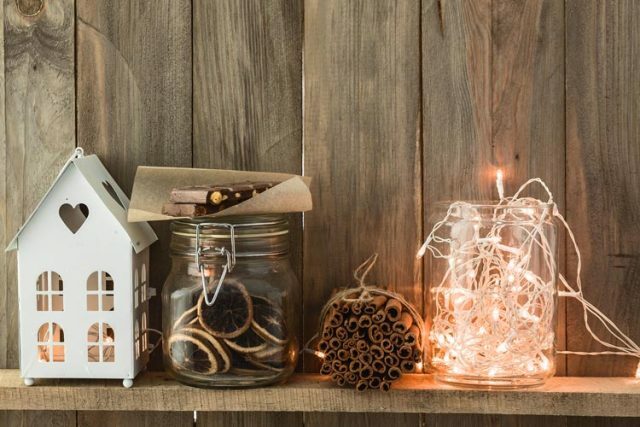 So feel free to adopt any of these decorating ideas to ready your home for the holidays. Use planks, boards or sections of barnwood or shiplap in the background or forefront—the possibilities are endless. Reclaimed, weathered wood brings warmth and authenticity to your interiors. Paint with a holiday message (freehand or with stencils) and imagery, or add hooks and hang stockings. Or cut the wood into any shape (such as a star or a cross) and mount it on the wall. Or create tables, borders, sconces and anything else you can imagine. Or, for maximum time savings, purchase already-made barnwood accessories and decorations! Whitewashing or pickling can add a distressed-looking surface to ordinary wood, achieving the appearance of aged barnwood. You get the same authentic, weathered look with a lighter, cleaner feeling. Combine this with a flocked tree and you’ve got a beautifully white Christmas. This is another highly versatile material that creates a raw, artisan feeling. If you don’t have aged metal, you can get that vintage patina with cleaning products and steel wool. Metal can be cut into shapes, used as a backdrop, made into furniture and used as wall hangings or outdoor decorations. Metal buckets, tubs and washbasins are one of the newest crazes; these can be artificially aged or used as-is and filled with gifts, floral/plant arrangements, pine cones, bells, ornaments and more. Give new life to old containers with holiday greenery decorated with ribbons and lights, small trees, dried floral arrangements, stocking stuffers and more. Old-fashioned milk cans have been popular for years and are available in ceramic and metal. A low wooden crate can be cleaned and used as a sideboard or centerpiece. Kitchen containers, like Mason jars, are also fun for décor and drinks. A small wire basket can be filled with ball ornaments. Any low wooden container, like a shallow drawer, can be filled with candles, greenery and ornaments and used as a centerpiece or sideboard arrangement. Farm families often have easy access to plants, which is why they’re often used in country Christmas decorating. While cotton bolls can look especially festive, other items closer to home for South Dakotans may seem more familiar and thus nostalgic. 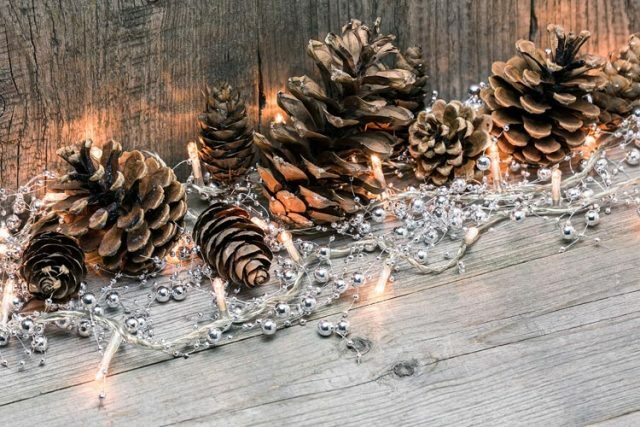 Pinecones of all sizes can be decorated with flocking, glitter, spray paint and more. Bundles of wheat, dried corn husks, branches of trees with berries, and of course evergreen boughs and even branches can be tied with red or metallic ribbons and adorned with ornaments. Remember, it’s about using the contrast that occurs when you combine natural and rustic with shiny and contemporary materials. Why do old things remind us of farm life? Maybe because many of us had grandparents who lived on farms and we associate things we saw in their homes with farming. Contemporary farmers’ homes are like everyone’s homes—we all shop at the same stores. 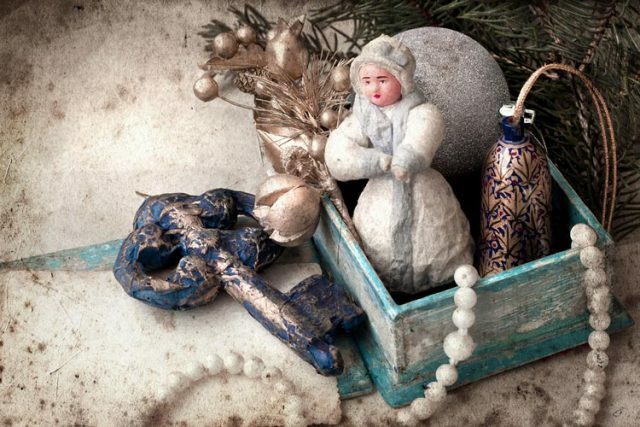 Regardless, vintage toys can be used as holiday décor; think sleds with metal runners, red wagons, train sets, toy trucks, antique bells, dolls and more. Adorn them with greens, gifts and decorations. Rough, textured fabrics can be turned into ribbons for tying greens, logs, dried plants and even utensils at place settings. Create a burlap or twine garland, incorporate burlap into a wreath, and use them as bows on anything and everything. Again, the key is to combine the rustic and shiny textures for visual interest. Because there isn’t much antique holiday signage available, it’s best to create your own or find a craft market or maker’s studio. Fortunately, you’ll have your choice of greetings and sayings; many people are using large-scale word art or calligraphy to express beautiful sentiments. These can be made of wood, metal, fabric or even a piece of slate, and decorated through color, lights or symbols for the holidays. These should be used sparingly; often one is enough. But if you have access to old-fashioned tools and equipment, you can use them in all sorts of creative ways as festive décor. Lanterns, ladders, rakes, barrels, yardsticks, bedsprings, carts, mailboxes, horseshoes, metal tubs, spoons, keys, bowls, jugs and other unique items can be lovingly repurposed with holiday style. Logs placed indoors evoke nature and the warmth associated with fireplaces. If you use real logs, make sure they’re clean. Combine them with greens as a centerpiece or use them as another element in a plant arrangement. Logs can be painted, adorned, wrapped, cut open, sliced, carved, drilled into and otherwise modified to make anything you can imagine. Or, simply tie a bundle of logs with bright ribbons to set near the door or fireplace. Adding a touch of farm-style Christmas to your home can bring additional warmth, cheer and good memories to the holiday season.